The "I'm Stuck in a Pit of My Own Creation"
I guess I’m running out of time. I made a webgl build with unity but for some reason the resulting files are large. I think if I specify ‘very slow builds’ it might optimize for file size. It controls with WASD and mouse. You have an umbrella, you can use it as a shield or close it and hit people. The art will change. I’ve participated in a few Ludum Dares before, but not very consistently. I’m pretty excited about being able to do it again. Previously I’ve mostly used Love2D, but I think I’m going to use Unity (2D) this time and develop with Web or Mobile in mind. The HTML5 export seems pretty cool. I also use Paint.NET, BFXR, and Audacity. Music is still a mystery to me, so I’ll try to make enough sound effects to prevent the game from feeling silent. There is no lasting objective, but the game looks a bit nicer now, and you can spend some of the resources for stat bonuses. I also recorded myself giving unit responses, so my game technically has sound, but I cannot guarantee it is any good. My plan now is to try to draw some more tiles so that I can have more terrain variety. I have shadows and torches! I’ve been more productive than I expected to be, so it looks somewhat decent. I click somewhere and it makes a target there. The blue rectangle dudes run to the location and then dig or place explosives until they reach it. Then I collect the resources, which will theoretically allow me to make more dudes. I entered as a Jam entry, instead of a compo entry in order to get more time but I only actually ended up with around 6 extra hours on the third day because I had to sleep and work for most of the extra time. There is a windows executable or a .love file, so if anyone on mac or linux knows how to compile love2d games, that would be really cool. 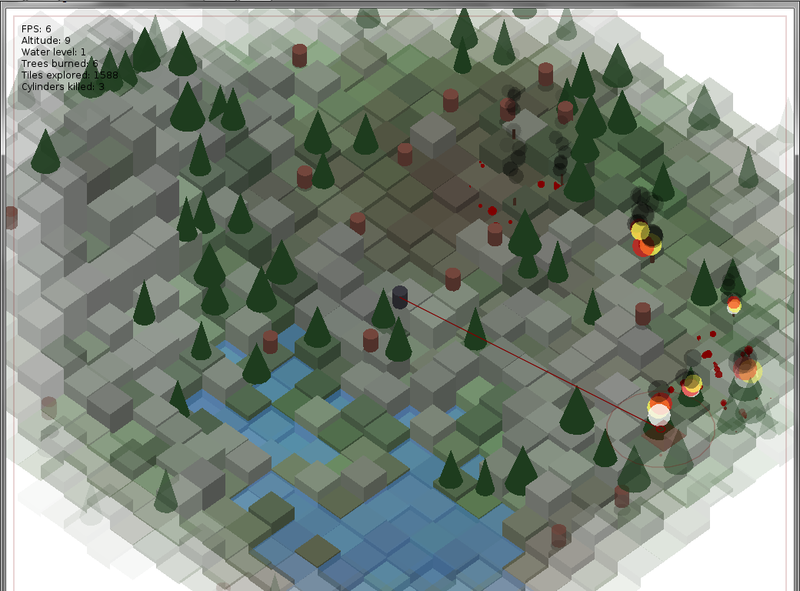 I created a pretty cool isometric rendering engine, which seems to be pretty capable. I put a lot of effort into tuning the terrain generation, and it ended up looking quite good in my opinion. I haven’t done much world generation before so I had to experiment a lot to determine what variations would look natural and interesting. The art style is 100% geometric, with everything being some composition of primitive shapes and it looks pretty cool. I would’ve liked to add a bit of detail to the “people”, but even as cylinders they feel lifelike enough when they are moving. The splatter and shadow effects turned out quite well because of how they interacted with the tilemap. I learned a lot about world generation, isometric rendering, and object oriented lua programming, so I would be more comfortable working with similar concepts in the future. It turns out lua allows you to define your own concept of a class and there are multiple ways to implement inheritance. I also now have a name for a “pigeonhole sort” which is a concept that I have sort of considered before but not properly executed. I spend most of the first day trying to figure out how to get objects to draw in the right order (back to front) until I realized that I had to make each object no larger than a single tile size or else you could get a circular loop of objects that are above, behind, in front of, and below each other. Performance issues: I put a lot of effort into making the game as efficient as I could, so objects that are far away are forgotten and things like the front faces of a tile are only drawn if the tile is taller than the tiles in front of it, and shadows are only drawn when the object is not on the ground. However, it still runs relatively slowly on my own machine and I assume even worse on the machines of some of the people that will test it. I added a few options at the end of the jam time to change the screen size and thus how many objects are drawn so that hopefully it can still be experienced even on lower end computers, but it is hard to get a sense for performance on another machine. There isn’t really much to do. You spend more time exploring than being a villain. I was planning on adding cities, farms, castles, and heroes for you to fight, but it all seemed so complicated and I ran into time constraints. I think I will try to work with a more complete rendering framework prior to entering, as I had to write a lot of drawing functions during the compo time. (cylinder, prism, sheared circle). I will also try to have a better idea of necessary gameplay interactions and try to get them in place before anything else, so that the game is 90% playable within the first day, instead of being 90% pretty after two days but still missing a bunch of gameplay elements. I know that my game idea was a bit too ambitious and so I set myself up for failure, but even so I think that having a challenge forces me to experiment and learn things that I wouldn’t otherwise have tried. So, it’s still pretty far from a complete game but I have been tuning my world generation to make it pretty interesting, and I can destroy trees as well as the cylinder people now. I’ll keep working on it as a Jam entry, although I won’t have much free time tomorrow. It’s also not particularly efficient right now, I assume because of the number of coordinate transforms and draw operations it has to do. I’ve made a lot less progress than I would like, due to countless difficulties with draw order sorting. I eventually scrapped by geometric representation of the world in favour of a true tile based setup, which makes it a bit easier to draw things in the right order, although I had to make the tiles rather large for the excess of coordinate transformations to not cause performance issues. I don’t feel much like a villain yet, but hopefully I can get a lot more innocent cylinder interactions soon. Also I should be able to make more interesting effects like the shadow under the jumping cylinder. After considering the theme I have determined that I want a top down world from which to act as a villain, although I don’t have too many details on what I want the result to be. I have created a set of orthographic draw functions with a z variable and the ability to draw a rectangular prism. The composition of translate, scale, and shear. Now I just need some sort of game logic and to make a particle system that can interact with a z indexed world. It’s been too long since I participated in a Ludum Dare. I’m in. I intend to work with lua and love2d, which seems to be more functional than it was when I used it last. I will use as many particle systems and geometric shapes as possible for graphics, and draw something messy in paint.net if I am inspired to have meaningful graphics. I dunno about sound, I’ll probably have a silent game or find some sound and music creation tools. I was hoping for the mirrors theme because then I could put my transformation matrices to work on vector reflection, but it looks like it wasn’t too popular. For the first time since roughly ludum dare 18, I’m in. I’ll be trying to figure out flixel. Ok so I decided to try to make a game with a person as the main character as opposed to a boat or a circle. My problem is that people walk and stuff. This is hard to make. 40 queries executed in 0.115 seconds.